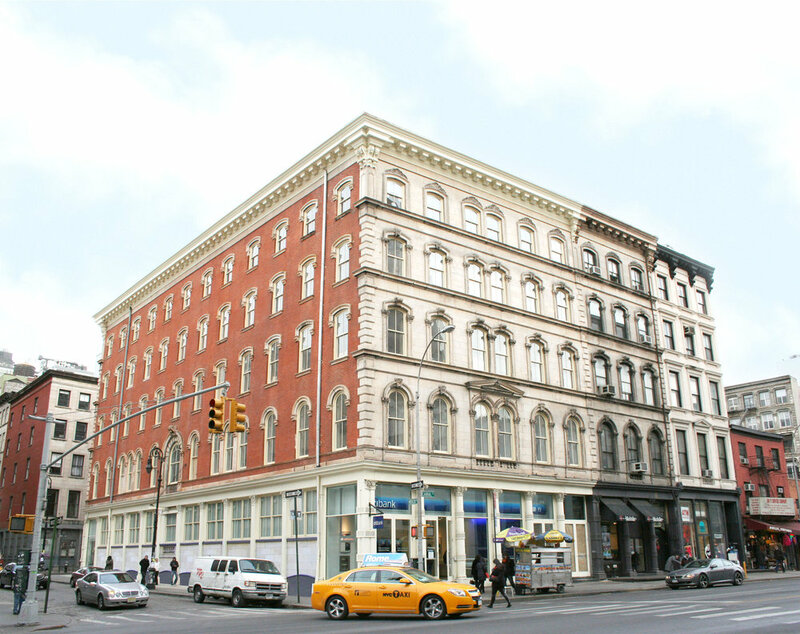 This adaptive reuse and historic preservation project largely restores the former Arnold Constable & Co. department store building at the corner of Canal and Mercer Street to its 1857 appearance while converting the interior to a rental apartment building with retail at the base. The restoration includes removal of a fire escape on the Mercer Street façade, cleaning and repair of the brick and marble facades and decorative elements, along with restoration of the building’s glazed storefronts and arched bases, and installation of new storefronts to extend the retail uses at grade. Additional cleaning and repair of historic fire shutters, and an interpretive replacement of historic grilles with new fritted glass patterned to replicate the grill pattern allowed for new transparency and connection to sidewalk passers-by. New windows to match the historic arched-headed double hung wood windows have also been installed. The interior was fully renovated to allow for new apartments, including new stairs and elevator, new kitchens and baths, and restoration of distinctive cast iron elements, both columns and radiators. The project received a Certificate of Appropriateness from the NYC Landmarks Preservation Commission and a Special Permit from the NYC City Planning Commission for the change in use from manufacturing to residential.